Spent Saturday night gone, marshaling a 3 Peak charity event on the summit of Snowdon, Teams of 5 to 6 persons have to summit and decend the 3 highest mountains in Scotland England and Wales within 24hrs. This type of event has come in for some criticism over the years due to teams 'racing' between mountains, disturbing local communities not set up to cater for mass intrusion and creating disproportionate traffic issues on small roads in rural ares. The organisers of this event at least have fixed start times so lessening the 'road race' element of the challenge. This year the event organisers bought the date forward to early June, hopping to avoid the terrible weather conditions in the previous years when the event was held in in July. In the past we have had to close down the summit 2 times due to 70-80 mph winds, and even cancel the whole Snowdon section due to atrocious conditions. 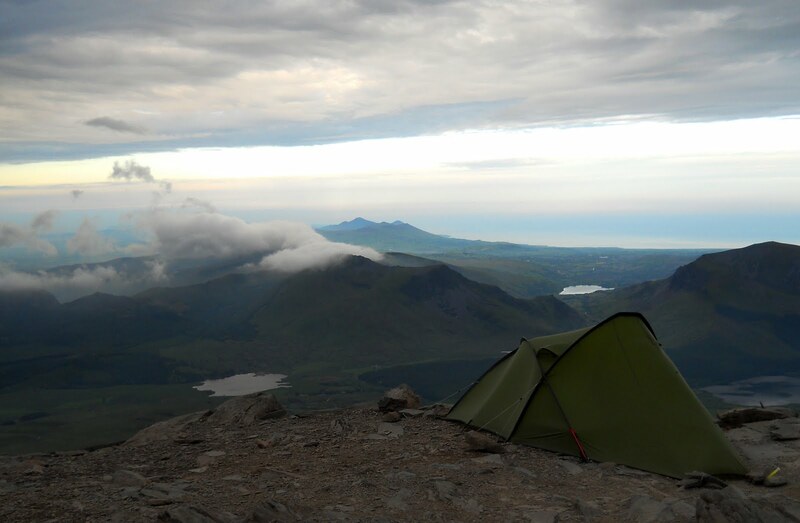 Snowdon is usually the last mountain and as such the competitors are usually pretty exhausted, by the time the reach the summit. Saturday evening started out fine then after about 8pm the cloud came in and the wind picked up, a balmy night was too much to ask for. With a railway and a cafe on the top you'd expect the summit to be pretty tame, however this all shuts down after the last train. In a thick welsh mist even route finding hear can be difficult. With considerable drops on two sides there is plenty of opportunity for a serious accident arising through complacency. Like several other sites in Wales, it is said that if two people spend the night there, one will become a great poet while the other will become insane, I always take a one man tent. Anyways the night passed off all ok with little drama and we eventually swept the mountain following the last team down on Sunday morning. Staying awake all night consequently gives you the Red eye time dislocation. At home I pick my face out of the Sunday evening meal. .........Ohh sorry did i drop off.